Steve Garguilo, Spencer McCullough, and Cory Trimm celebrate breaking world record for tallest stack of waffles. In many parts of the of country, this weekend kicked off the summer in fine style: clear skies, warm weather. 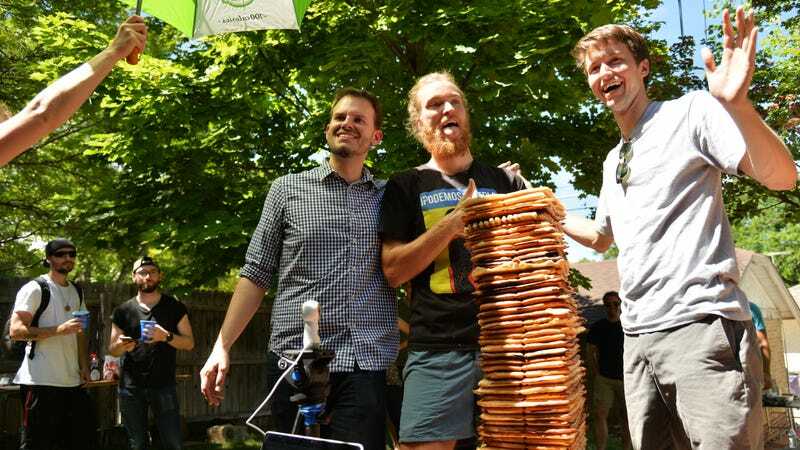 But while you were soaking in the pool or hanging at a backyard barbecue, 23-year-old Spencer McCullough spent the start of the weekend in sunny Denver by breaking the world’s record for the tallest waffle stack: an impressive 67 centimeters, beating the paltry 51 centimeters of the previous record. To aid him on his quest, McCullough drafted Denver land surveyor Dustin Hoaglin to carefully measure the effort, and his friends Cory Trimm and Steve Garguilo to help cook and stack the waffles. Reporter Elisabeth Hernandez was on hand to cover the effort for The Denver Post, which included a few moments of drama involving wobbly waffles. In the end, the project was deemed successful, certified by judges with a 3D model and lasers, although the record-breaking is apparently awaiting official confirmation from Guinness Book. Still, it certainly trumps anything I accomplished this weekend, where my feats included reading a whole trash novel in a single day, avoiding sunburn, and making par at a few (but not all) holes of miniature golf. What should I do with my Mario Batali cookbooks now?